If you've already seen how to make a LED blink you may want to know how to go further. In this workshop we look at the first steps of the process of developing a prototype of a practical device. Well, almost practical. The proposed final product indicates the intensity of light as a bargraph comprised of a set of LEDs. The dimmer the light, the more LEDs are lit. In the workshop, participants start by building the circuit using a solderless breadboard. Then they run a series of Arduino programs, sketches, that have been prepared for the course. 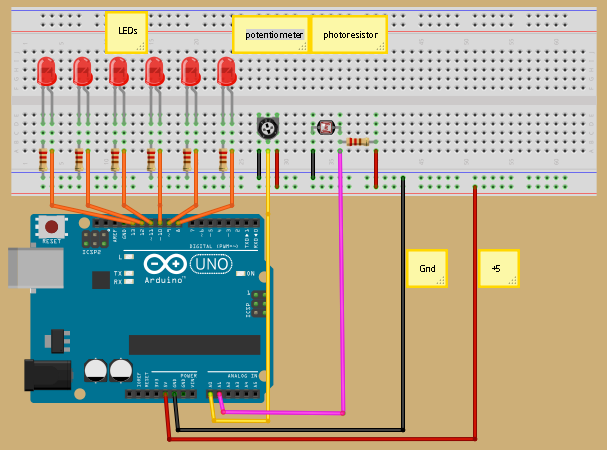 Sketches are developed using the Arduino Interactive Development Environment (IDE). It is an application that can run on Mac or Windows or Linux. The IDE is used to load each sketch. A sketch can write diagnostic messages to the serial port. The messages are displayed in a window of the IDE application. The final sketch can run without the USB connection to a laptop. Once it's loaded, the device can run anywere there is a power supply. You will need a laptop computer. Load it with the Arduino develpment software. This type of application is called an Interactive Development Environment(IDE). Download the sketches. Unzip them and look at the files. Look at the list of parts. They can be purchased at any electronics supplier. Some will be avialble at the class for sale. Some for loan. But if you want to be sure, bring your own. It would be helpful to know Ohm's law. But not a lot of depth is required. Construction involves poking wires into holes. You can do quite a lot with Arduinos without deep understanding of electronics. For most of the devices that you would connect to Arduino, there is little complexity to the circuit. If you circuit grows in size, you will want to learn about soldering techniques and, possibly, printed circuits. But that is far down the road.